Since the possibility of making a comparative test between these two lenses was suggested to me, I had the feeling that it was not going to be easy to write this article, as I have been very pleased with both lenses and have taken some magnificent photographs. Comparing “two good friends” is complicated, but I am going to try and be as objective as possible, because there are certain differences. First, a bit of background: at present I am using a Canon with a Full Frame sensor – a Canon EOS 6D, to be precise. Both lenses, the Samyang and the Irix are equipped with the Canon EF mount and can be used on both Full Frame and Canon APS-C cameras with the well-known 1.6 crop factor. I understand that different mounts are available for these lenses. I recommend visiting the two manufacturers’ websites to make sure which mounts are available. I have carried the Samyang 14mm lens in my backpack for over two years. Being a photographer specializing in landscapes, it became one of my most favorite tools from the outset. As previously mentioned, I have taken some very good photos (according to my criteria, of course) with this lens. However, I always realized that something was missing, not in sharpness and resolution but in certain optical aspects, as well as speed. To say it another way, taking a photo well with the Rokinon (Samyang) took time and therefore I sometimes lost the right moment while adjusting and checking. 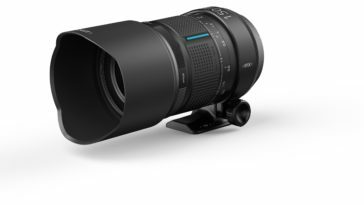 Some months ago, I got news of the new Irix lenses, with a nearly identical focal length as the Rokinon (Samyang) and that advertised a series of advantages that could improve the experience of using a super wide-angle lens. In this article I will analyze and comment on these and other details. So, let’s commence the comparison of the Irix 15mm and the Rokinon (Samyang) 14mm. More precisely, the two lenses that I am going to compare are the Irix 15mm f/2.4 Blackstone and the Rokinon (Samyang) 14mm T3.1 VDSLR IF ED AS UMC. This is the Rokinon (Samyang) cine lens version which is a bit different than the ‘standard’ model. It has the same comportment in photo taking as it shares the same optical construction. The differences are in the actual construction of the focus rings and aperture gearing, threaded for coupling to Follow-Focus systems; also the aperture ring is “declicked” which means no jerks when changing from one aperture setting to another. This is specifically for video filming and allows the aperture to be altered without jerks and allows a progressive change in brightness or depth of field. Although I am a Technical Engineer and I am constantly explaining to my students how to do technical laboratory tests, I thought that if I was just to submerge readers in technical data, the various brands are there to do that, so I am going to carry out a real comparison between the Irix and the Rokinon (Samyang), or at least I am going to try to. I will be taking photos of my hometown with the two lenses and will compare the experience of using one against the other. I will be as impartial as possible and will post photographs of everything, hoping that this article will help readers draw their own conclusions. The physical differences immediately jump out at you. The Irix is bulkier than the Samyang, although if the lens hood is removed from the first one the differences are not so great. Therefore, one may not take up a lot more space than the other. According to my kitchen scale the Irix comes in at 693 g and the Samyang 575 g, in both cases with the rear lens caps on but without the front ones. 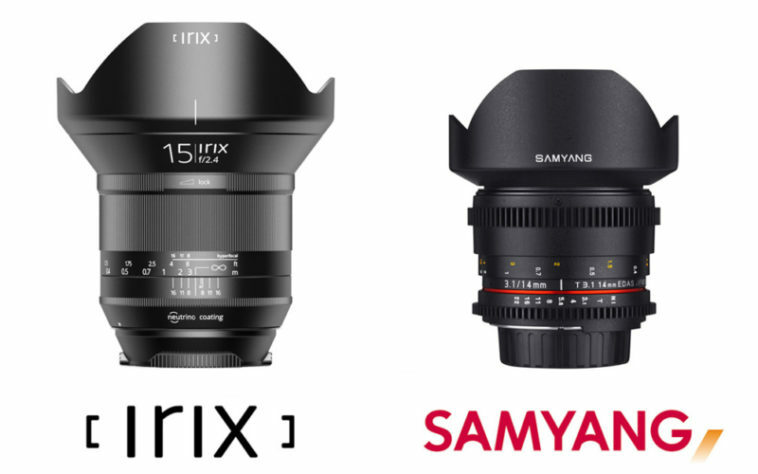 In this case the Samyang is more similar to the ‘light’ Irix Firefly model which is also made of plastic. It will impede the use of a conventional filter holder and means resorting to one that is exclusively for this lens. Instead of being attached to the filter thread it has to be attached to the lens hood. It also means bigger filters have to be used, making these filters and filter holders more expensive compared to the Irix. Being able to remove the lens hood is going to help keep the lens in a backpack, occupying less space and volume. Also, in the case of the Irix, it fits perfectly when reverse mounted which avoids it becoming lost in the backpack. In the case of a bad knock that causes the hood to break (I have seen this happen to more than one of my colleagues in the past) the Samyang sees some sort of ‘patch’ having to be carried out to repair the damage. However, in the case of the Irix, a new lens hood can be found (at a reasonable price too). Lastly, another advantage of the Irix lens hood design is the possibility to mount circular screw-in filters (95mm diameter), and to which adjustments can easily be made through a small window on the hood. I understand that a lot of colleagues don’t think these details are very important, seeing that they don’t usually carry filter holders or filters (and tend much less to break lens hoods). However, when buying one lens or the other, I believe it is worth thinking about the future, as these products can last for quite a few years. So, even though you don’t currently use filters (like me) the logical evolution as a photographer will almost probably mean they will be used. So, thinking of the future (for those of us who don’t use them yet) the better option in my opinion is the Irix rather than the Samyang taking this aspect into account. 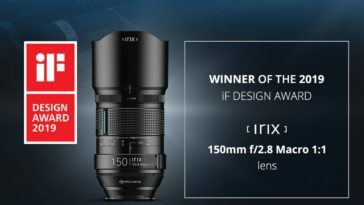 Comparing the Irix 15mm and Samyang 14mm, the focus will be on their optical capacity and the following 6 aspects: focal length, sharpness and/or resolution, chromatic aberration, flares, vignetting and optical distortion. A photographer in a forum once told me that 1 mm in this focal length is a lot and that it is not the same having a 14mm as a 15mm focal length. The truth is that the difference exists. I have taken two photos (four in total) so that the focal length can be compared at different moments and your own conclusions can be drawn. Differences exist as can be seen in the photo, but from my point of view they are few and even less if it concerns an open air landscape. As can be seen, the differences in this type of framing are almost non-existent. If we need to include a bit more framing with the Samyang then we will include a bit more. Both lenses are characterized by having a high resolution especially in the central zone and in intermediate apertures. However, when we use the widest aperture, things change. So, although the Samyang lens is very good, the Irix even having a bigger wide aperture is much sharper on the edges of the image. First, let us compare the lenses in the central aperture zone, with the idea of maximising the depth of the field. The photo was taken at f/8 with both lenses, with the camera on a tripod to make the conditions as equal as possible. It can be observed that in the center area of the image there isn’t much difference between the lenses. The Irix is perhaps slightly sharper, but it is very difficult to choose between one and the other. However, if we look at the corners it can be seen that the Samyang has a noticeable lack of resolution and sharpness, with the details being a bit ‘pasty’ and blurred. With the Irix lens the resolution remains stable and it can observed that there is the same level of detail in the corners as in the center. In the following photos, as seen, with the widest aperture the Irix behaves notably better. Looking closely at the planters a lack of sharpness in all the leaves can be appreciated. Even taking into account the shallow depth-of-field that means not all the leaves are focused in the same way, texture of the leaves in the photo taken with the Irix is more noticeable. As I mentioned before, the differences are very slight, but exist, and actually depend on the level of detail we are talking about and that we want to obtain, of course. That is to say, both lenses have magnificent detail and resolution. I don’t really want to knock the Samyang, as it is a lot better than many more well-known brands, but the sharpness and the resolution of the Irix is, if I have to use just one adjective: incredible. Concerning chromatic aberration, I have to say that we have two lenses that perform very well in this area, creating hardly any color aberration in all the photos. Photographers know what chromatic aberrations are and how they can be corrected. I tried to exaggerate situations to try and find some chromatic aberration in both lenses, creating the same conditions in each shot. The aberrations usually occur on the edges of the images, when the light source is from behind or with high contrast, on the edges of any elements such as tree branches or aerials, etc. So, knowing this, I got to work. As can be noticed, in the case of the Samyang, apart from the afore-mentioned lack of definition on the edges, we can see how chromatic aberrations are becoming apparent, albeit just a bit, green on the left-hand side of the branches and purple on the right. In the photo taken with the Irix, the sharpness is incredible as I have said before, but also no chromatic aberration can be seen on the edges of the branches nor on the leaves. I really tried to make these aberrations appear, and even then, in the Samyang it’s not very noticeable, but with the Irix there is none at all. Flares and ghosting are practically unavoidable with wide-angle lenses. The 14mm and 15mm of these respective lenses make it very difficult to totally eliminate flares and ghosting, particularly if there is a front light source in the shot. Both lenses resolve these flares very well, minimizing their effect, without causing too many evident elements that make a photo unusable. Ideally, with either one or the other, the best thing is to move the frame slowly until the flare or haze disappears from the shot. Firstly, the camera’s sensor has to be cleaned, because a series of ‘swimming ducks’ can be seen in the river Huelva as small circles. But with so much changing of lenses without due care sometimes it’s inevitable that dust will enter my Canon EOS 6D’s sensor. I have to admit that, as I was a bit embarrassed, I did delete the most evident ones with Lightroom, but I can promise you that is the only retouch they have had and are the only two in the whole article. It can also be seen that in these photos taken hand-held the horizon is slightly crooked in the Samyang photo. The second thing that is noticed is the sensor flares created by our lenses’ diaphragms. We can see that the sensor flare coming from the sun in the Samyang photo is a six pointed one, however in the Irix one it is nine pointed (only the long points are counted). 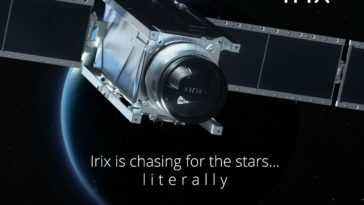 How will this affect my images: the bokeh in our photos with the Irix will be more circular and of better quality; also the [sunbursts] will be even more spectacular. The vignetting in both lenses is quite contained. 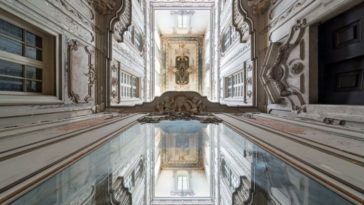 Studying the numerous photos in this article, only in the ones that have a higher optical perception can some shadow be noticed in the corners. But it’s virtually unnoticeable and can be solved with just a small vignette adjustment in Lightroom (an adjustment that we haven’t applied to any photo in this article). Finally, I think the optical quality is worth a special mention, as here there is a great difference between the two lenses. I am not referring to the typical perspective distortions that wide-angle lenses generate but the distortion of lines that should be straight, that in some cases the lenses make curved due to their own distortion. The Samyang lens has the characteristic ‘mustache’ geometric distortion that makes some of the lines that run horizontally through our images curved. However the worst part of this distortion is that it’s not just one curve, but several and wavy. It looks like a mustache. Standard distortions can be easily corrected with editing software, but the distortion created by the Samyang is quite complicated to correct and it would take quite a while to edit, even using some of the default correction settings that exist in the applications. The photo is a JPG converted from a RAW without editing. First, look at the port crane’s rails, then look at the edge of the quay, and even though it nearly didn’t appear in the photo, you can see the line of the other bank of the river Huelva, (Bacuta Island and the marshes of Odiel) they are all badly distorted. However in the photo taken with the Irix the lines are a lot straighter, without any significant distortion. The coastline doesn’t appear due to the focal length difference, but in any case, with the Samyang the coastline would have had to be cropped.The problem is not only in this photo. If you look at the plants in the planters that I put up earlier, the edge of the wall where the plant pots are is perfectly straight in the Irix photo and has the mustache curve in the Samyang one. For me, someone who uses the wide-angle lens in architectural photography, I can say that the Samyang causes a lot of headaches. The Irix is a delight as I don’t have to waste time correcting these distortions, which means a lot of time spent in front of the computer. but the Irix has some aspects that surpass the Samyang and tip the balance in its favor. Almost all the photos that I have posted up to now in this article have been taken with the camera on a tripod and have been focused using the infinity focus or hyperfocal distance. Sometimes, when it’s impossible to use the tripod, it’s advisable to carry other quality accessories that allow you to stabilize the camera with total confidence. Although I haven’t done any night photography for this comparison of the Irix 15mm and the Samyang 14mm, I have done some previously, mainly with the Samyang. Many times I have found it very complicated and tedious looking for the infinity focus, sometimes I ignored the infinity focus, adjusted the focus even further, and lost the shot. With the Irix, thanks to the ‘click’ which shows the exact position of the infinity focus I was able to focus on the stars at the first try. Even in some of the landscape photos, like the one of the Calatilla quay (Visitors Reception Center in the Odiel Marshlands) that I posted at the beginning of this article, the marked infinity focus is a great help. Other photos in this report were taken using the hyperfocal distance scale chart. To use the hyperfocal scale, the first thing to know is that depending on the size of the aperture, what the hyperfocal distance of the object is. For this there are charts and/or apps that give you the value of the distance from which you should focus so that from half this distance to infinity is focused. The most experienced photographers know more or less how their lenses function and know exactly what this distance is, the problem is that sometimes it is complicated to focus (more so with a manual focus lens) at this distance and properly control the focus. For example, in this photo taken with the Samyang hyperfocal scale, it was just off and I was a bit short of the focus distance so therefore wasn’t able to achieve what I wanted, which was that both the bollard and the quay on the other bank were in focus. Perhaps due to the size of the image on the web page, it isn’t very obvious, but the bollard 36 is focused while the building opposite and the salt lakes aren’t adequately focused. What is evident in this photo is the geometric distortion that I talked about previously. However, with the Irix, taking photos using the hyperfocal scale is very simple, as it is actually engraved on the focus ring. These marks are adjusted in relation of the aperture you have established so then the shot is focused with the hyperfocal distance, guaranteeing the best depth of field possible for this aperture. Photographs aren’t always taken at infinity or hyperfocal distance, moreover, the majority of the time a tripod isn’t even used; just hand-held shots are taken. 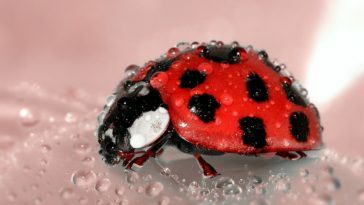 “In cameras equipped with Focus Peaking, manual focusing is greatly helped. 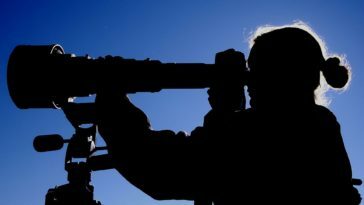 We will see if Canon starts to make it standard for all their cameras to have these characteristics”. In this situation the Irix lens is clearly superior to the Samyang because it has a focus confirmation sensor. The lens doesn’t have a motorized focus which means the focus ring has to be turned manually, but once the fundamental elements are focused the corresponding focus zone selected lights up and the focus confirmation will give the typical beep. For example, in these photos I took in one of the most spectacular places in Huelva, which is its unrivaled El Carmen market (with its fish, seafood, fruit, vegetable and meat stalls as well as, for me, one of the kings of the Spanish gastronomy: Jabugo serrano ham), I used both the Samyang and the Irix at their widest apertures. Experience tells me that I shouldn’t trust the focus through the Samyang’s viewfinder, due to the fact that the viewfinder of my Canon 6D isn’t one of the most bright. I wear glasses and a few other factors meant that when I opened more than one photo on the computer that I thought were in focus were, but not where I wanted it to be. So I always, by precaution, use the LCD display and then use the zoom to confirm the focus. All this means that I can’t take the photo quickly and directly. The movement of the subject makes me have to re-focus and I always have to take several test shots. This still life of the Serrano ham carver in his market stall with the Irix lens was completed in a lot less time thanks to the built-in advantages. Always looking through the view finder (as if I were a professional…hahaha), I turn the focus ring until I hear the focus click and the focus point lights up (normally I always have the center focused). I take the photo just then or I wait for the right moment. Due to this, focusing with the Irix lens is something nearly as simple as with an automatic focusing lens. I have left until last one of the areas in which both lenses are totally different and that is in the diaphragm system. On the Samyang lens the diaphragm is completely manual and controlled by a ring on the lens housing. 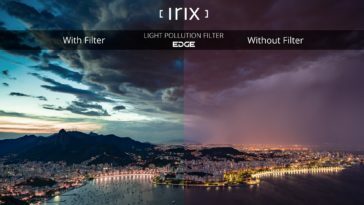 However, on the Irix lens, the diaphragm setting is completely controlled by our camera’s processor and the automatic and semi-automatic programs available can be used. Now comes the discussion that “professional photographers” never use semi-automatic programs. I really don’t mind what other people use, I use them and sometimes I think it is the best option, especially in certain circumstances. Everyone is free to take their photos how they prefer, to get the best result. The Irix offers great help in this domain, as the communication between the lens and the camera is constant and can help us in certain circumstances. It can precisely control the aperture with our diaphragm or let our camera’s exposure control set it according to the light needed. Another interesting point is that the Irix system, compared to the Samyang, records the photo’s EXIF the exact aperture with which you took the image and that can sometimes be helpful, especially for me, when I am giving a photography course or workshop. Not treating the subject of night photography, I only have one more feature of the Irix left to talk about. The barrel markings on my Irix Blackstone reflect ultraviolet light, so when I go to a nocturnal meeting with my colleagues I take out an UV light and leave them all speechless (hahaha… I’m only joking). Although for a lot of people it is a trifle, it helps greatly when we are doing night photography, avoiding using normal torches. The pupils in our eyes take about 20 minutes to become accustomed to the dark after having been subject to normal torches, so as can be imagined it could be a problem having to be constantly turning on the torches to adjust the lens focus. Therefore, this is a really useful feature. To sum up the comparison between the Irix 15mm and the Samyang 14mm, I can only say they are both very good quality lenses with a fantastic quality-price ratio. However the amazing optical features of the Irix, that I think at present has no rival for under 2000 euros, the complete lack of geometric distortions and chromatic aberrations, the inbuilt aids it has to make the focus system much more simple and above all quick and the automatic diaphragm system means that the Irix has set a very high benchmark. In making this comparison I have tried to be as objective as possible. Because of the above the Irix is superior to the Samyang 14mm, although I do admit it provides stiff competition.